NEWS: EOSIO Release 1.2.2 has been released! This release provides bug fixes and non-critical security fixes. 397659b created the potential for there to be no pending block after the call toproducer_plugin_impl::maybe_produce_block if the block was produced more than 5 seconds after its intended deadline. This is an exceptional case observed only when producing blocks on a node that is also servicing a large RPC request load. Nevertheless, in that case the logging that would execute after the call to producer_plugin_impl::maybe_produce_block presumed that the pending block was present and valid without checking resulting in a dereferenced null pointer. Previous filtering functionality in the deprecated history_plugin was based on action_trace which includes the actions that implicitly execute during a transaction. The filtering for MongoDB was meant to be identical to that functionality. Changes to cleos in v1.2.0 broke this tutorial script. Use of this parameter was deprecated in the v1.2.0 release and is being removed. Occasionally, RPC responses would misreport a successful transaction submission as unsuccessful due to time constraints on pretty-printing the action payload. /v1/chain/get_required_keys was not taking the delay in the transaction into account when determining which keys to return. We tested on Jungle Testnet and We are done on Mainnet. Thanks to Cryptolion! If you are an advanced blockchain user, feel free to use any of those tools that you are comfortable with. If you like what we do and believe in EOS9CAT, vote for eosninecatbp! Waiting for your support. Have a question, send an email to us or visit our website. FOLLOW US on Facebook, Telegram, Medium, SteemIt, Github, Meetup E0S9CAT, Reddit, Twitter, and LinkedIn. What is the whole big deal about RAM? We often see the word “RAM” juxtaposed next to EOS on THE daily crypto newsfeed, but what the heck is RAM anyway and why should we keep an eye on its price even for the folks who just only want to dive their heads down into smart contract development. There essentially three type of resources in Eos: bandwidth (Network), computation and computational backlog (CPU) and state storage (RAM). RAM is essentially the gas that fuels each transaction invoked within the smart contract, unlike disk and CPU which are fractional resources acquired through staking tokens, RAM is one which needs to be purchased from eosio.ram with a price pre-determined by the Bancor algorithm. The Bancor algorithm will dynamically facilitate the price base on the current demand and supply of RAM and settles it at a market equilibrium. Therefore, all transaction to buy and sell ram is a unilateral transaction with eosio.ram. The secondary ram market incentivizes those will RAM reserves that have no use of it to sell it to those that need them. Because Eosio endorses a free-for-user philosophy, the burden of running the network falls on the developers. We need to reserve enough RAM for our smart contracts to function properly on the Eos network. Throughout our smart contract development on the EOS platform, we may encounter a situation in which the RAM that we are allocated doesn’t fulfill the requirement for deploying the contract. In such cases, we’ll need to purchase additional ram with EOS token in order to proceed with contract deployment. This entire process can be accomplished with the CLI tools, namely keosd and cleos, provided by Eos-io. In our previous articles, we have gone through the procedure of setting up a local development environment for testing smart contracts. If you have followed those steps, we can interact with main-net and test-net with the same tools with a few configuration changes. Let’s start by pointing our cleos application to a test-net node instead of our local running nodeosd. We can create an additional alias to register this configuration. In the above command, we have created the alias cleos-test to quickly interact with the eos test-network node provided by eos9cat. Notice that we are still relying on our local wallet application for handling our private keys. As long as we have the corresponding private key imported in an unlocked wallet. Tips: If you want to save the command persistently, you can put the command inside of the file ~/.bashrc if you are on linux and ~/.bash_profile for mac. In such a case, we have to buy more ram from the eosio.ram. The quota attribute under the memory section indicates the amount of ram that the account allotted. Now that we know how much ram we are entitled to, how can we possibly know how much ram we need to deploy our smart contract? Since the Eosio blockchain executes user-generated applications and code using Web Assembly, we can get a rough estimate about the number of kilobytes needed to executed the smart contract by summing the size of *.wasm and *.abi files. In addition to figuring the rough estimate, we will have to determine the amount Eos token that will be required to purchase the ram. The Eos blockchain platform relies on the Bancor Algorithm to facilitate the secondary ram market through a unilateral transaction model, we can determine the Eos ram price by consulting ram market table exposed by the system contract and performing some simple calculation. To acquire the EOS/KiB, we need to divide the quote.balance – the connector balance – by the base.balance – the ram token outstanding supply and finally multiply the value by 1024 (quote.balance/base.balance)*1024. In my example with the smart contract that I wanted to deploy will require around 100 KiB which will cost around 31.70 EOS token. We can then proceed with the actual transaction by issuing the following command through Cleos. The k flag will indicate the amount parameter indicates the amount of KiB to purchase, the system contract transaction will automatically deduct the appropriate amount of EOS token from the payer’s account. Without the kflag, the amount will indicate the amount EOS token wishing to be spent. Likewise, an appropriate amount of ram will be added to the account according to the ram price. If we now deploy the contract again it should succeed. For the unneeded ram that the account is currently occupying, it is possible to exchange the resource for some EOS token through the system contract by a price settle by the Banchor Algorithm. Selling ram is a similar process to buying ram on eos blockchain. RAM is arguably the single most sought-after resource on the Eos blockchain platform due to its flexibility. Not only RAM can be used for store intermediate states of computation, it can also be used as a persistent storage. The multi-indexed database is a data structure within Eos that provides flexibility in where the data is stored depending on how the scope is defined. Multi-indexed db will house the persistent data in a table format. In fact, unlike many other popular smart contract platforms, the transactions within the Eos smart contracts cannot return any value or variable, which mean any data captured by RAM cannot be returned to the caller by the transaction. In order to gain access to the variable value within the smart contract, e.g. result of a certain computation and transaction, the data needs to be updated through a multi-index db table with a scope, an associative link to the data stored normally in the form of account name of the caller or the account name of the smart contract itself, then the data can be retrieved by gettable API with the appropriate contract name, scope, and name of the table. Determining the scope and table name can be tricky especially for contracts that are produced by others, the table name can normally be quickly retrieved by looking at the abi of the contract. The scope is harder, but it can be determined by looking through the parameter when the reference to the multi-indexed db is made within the code. The first underlined part shows the reference to the stats table is made with ‘sym’ parameter which denotes the SYMBOL of the token; hence the scope of the table is the SYMBOL of the token. The first underlined part depicts the line that makes the reference to the accounts table when the balance is subtracted during a transaction. 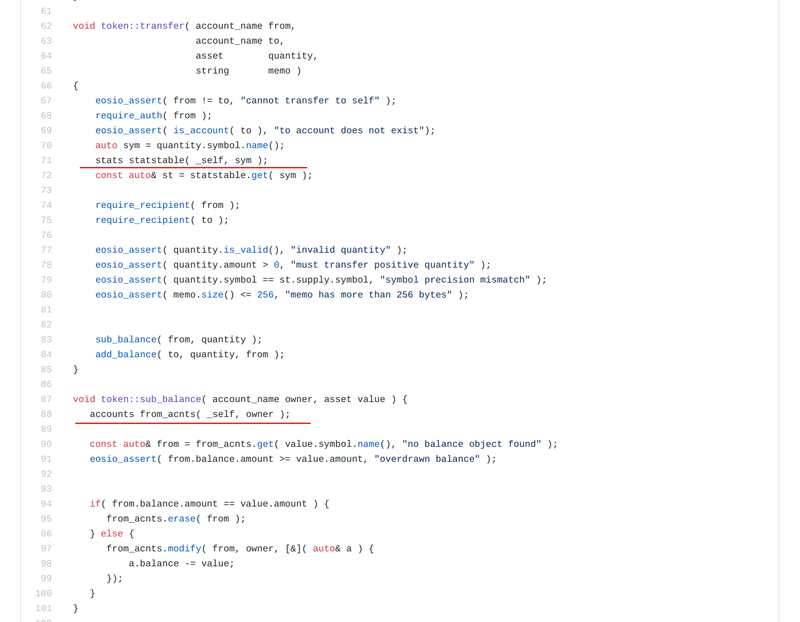 This line of code hints that the scope of the table accounts is an account name. For more tutorial and information about using multi-index db within smart contracts, please stay tuned for our next article. Since the connection between the smart contract itself to the multi-index db stored on local disk is merely a reference link, this feature in conjunction with deploying a contract multiple times with the same account grants the feature to upgrade smart contracts in the eos ecosystem. The reference to the data can be made in the new smart contract as long as key features that define the multi-index db is identical across the old and new smart contract. In some cases, you may even find it useful to free up RAM for sales by deploying an empty contract or one that is significantly less in size while still keeping the data related to the former contract on persistent storage. If you like what we do and believe in [EOS9CAT](www.eos9cat.com0, vote for eosninecatbp! Waiting for your support. Have a question, send an email to us or visit our website. NEWS: V1.1.1 has been released!! The release of v1.1.1 provides critical security updates previously disclosed to existing EOSIO-based blockchain custodians as well as non-critical security updates. Calling cancel_deferred(sender_id) using the sender_id of the currently executing deferred transaction was not properly handled. This has been resolved so that the cancel_deferred call semantics match the expectation that passing invalid or already-retired sender_id is a no-op. The currently executing transaction is considered “retired” WRT these semantics. In this case, the remaining producer nodes who could provide the needed confirmation would calculate the wrong time to wake-up and produce a confirmation. In extreme cases, this would lead to enough producers abstaining from production, despite being live and ready, to stall the promotion. This issue has been resolved. The BNet plugin exchanges messages with peers to optimize out multiple delivery of a single block. There is now a limited window of retained block IDs for this purpose. The Net plugin has improved sanity checks on incoming block requests. Contracts which compared extended_symbols using the < operator would not take the extended information about hosting contract into account. This change will be reflected in the next release of the WASM SDK. EOS being a newborn in blockchain space, promises to deliver vertical and horizontal scaling of decentralized applications unmatched by the other Blockchain platform out there. The technology and infrastructure of the EOS blockchain will eventually have the capability of driving millions of transactions per second through a fast DPos – Delegated Proof of Stake – consensus algorithm. At EOS9CAT, we are developing applications with the amazing technology. We feel that it’s absolutely crucial to share our experience and hope to inspire you to build something of your own. Nodeos is a daemon that is used to host and run EOS node. Keosd is a light-weight wallet client responsible for protecting keys and signing transactions with them. Cleos is a command line tool to interact with EOS blockchain and serves as a bridging component between Nodeos and Keosd. Make sure your system has 8GB of RAM and 20GB of free hardware space. Docker is a container management service that runs on top of the os kernel to allow for easy application development and deployment by allowing developers to synthesis a sandbox environment with fine-tuned system environments, variables, and packages. In order for them to develop with Docker containers, it’s necessary to install the necessary files and programs, please follow this guide: https://docs.docker.com/install/ and install docker for your corresponding os. The above command will essentially spawn two containers base on the eosio-dev docker image with one of each running the Nodeos client responsible for interacting with the blockchain and Keosd for managing the wallet. EOSIO provides a Docker image on docker hub – which is the equivalent of Github for Docker – that is pre-packaged with the necessary toolset needed for developing smart contracts for the EOS blockchain. Note: EOS also offers an eosio docker image on Docker Hub which is significantly smaller in size in comparison to the dev image. The dev image will be crucial in smart contract development because it contains eosiocpp which is the essential compiler for translating C++ code into web assembly code understandable by EOS blockchain. Since the cleos alias is set to execute the process in the keosd container environment, the wallet-url flag is set to localhost of port 8900, and the flag is set to point to the address where nodeos is running, which in this instance is another container. Verify the alias set correctly. In order to create accounts, you will need two pairs of keys: owner key pair and an active key pair. Each account has an owner key pair and an active key pair. The active key pair is for signing transactions and owner key pair is responsible for the account owner. A Wallet is a place where you store all of your key pairs which may or may not associate with the permission of one or more accounts. A default wallet will be generated after passing the command, you can also specify the name of a generated wallet by passing a the n flag along with the name as an argument. By default, a wallet will be immediately unlocked after its creation, and a locked wallet will require the passphrase generated during wallet creation to unlock. The asterisk beside the wallet name indicates that the wallet is currently unlocked and available. Now that we a wallet and couple of key pairs generated, it’s time to import the keys into the wallet. Run the following command twice and each time with a private key generated before. Since the actions performed on the blockchain must be signed using the keys associated the authorizing account(producer), we can mimic this interaction by creating a separate wallet that will import the producer’s private key found within the config.ini file inside the container. In the above command line, the first key will become the account owner key and the second key will become the active key. Note: although that the owner public key and active public key can be the same, it’s highly recommended to use two different keys in a production environment for security purpose. Once you have the account ready, you are all set for the development environment. Now that the wallet and accounts are properly set up, it’s time to deploy the system contract. For the purpose of the tutorial, eosio.bios will be used, the contract can be found within the folder of /contracts/ inside the container. In the public EOS blockchain, system contract is used manage the staking and unstacking of tokens and reserve bandwidth for CPU and network activity, and memory for contracts. Again, we’ll be using the eosio producer account credentials to sign off the contract deployment. Note: the arguments passed with the alias will refer to the environment variable and path that’s associated with container context instead of the host. If the EOS blockchain needs to be shut down, you’ll do it gracefully by issuing the following command. Now that we have everything set up, it’s time to move on to the next stage of actually writing and deploying smart contracts in EOS ecosystem. Stay tuned for EOS9CAT’s next article. Enterprise-Grade, made by Community, for Community. An EOS Block Producer Candidate & Blockchain Technology Firm proudly based in Vancouver, BC. EOS9CAT is a MiningSky Project. © 2018, Built by EOS9CAT. All rights reserved.